Lit. eight-ridge construction. A complicated roof style with multiple ridges and bargeboards, or large vernacular house built in this style. Characterized by complexity, scale and grandeur; the actual number of ridges is not necessarily eight. The style was often used for the homes of wealthy farmers, craftsmen, or townsfolk, and many features were adopted from shrines of the gongen style *gongen-zukuri 権現造, from temples, and from castles. In contrast, interiors were relatively simple, in the style of folk dwellings. Good examples are the Imanishi 今西 house and the Toyoda 豊田 house in Nara (both mid-17c). 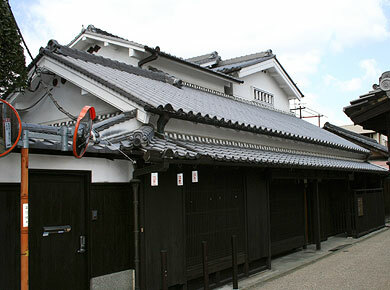 They have large hipped-and-gabled roofs *irimoya-zukuri 入母屋造 much like those of temples, with dormer bargeboards *chidorihafu 千鳥破風, smoke louvres, and gable pendants *gegyo 懸魚 attached to the gable bargeboards. Exterior walls are plastered *nurigome 塗込 like castles. A farmhouse in the yatsumune-zukuri is the Toshima 豊島 house in Ehime prefecture. This is a large structure, rebuilt in the 18c, with a highly complex thatched hipped-and -gabled roof. The earth-floored area *doma 土間 and the raised living room kyoshitsubu 居室部 interlock at right angles, and the entire perimeter of the structure is fringed with a wide, tiled covered veranda *hisashi 廂.